I have been cooking up a storm this holiday season! 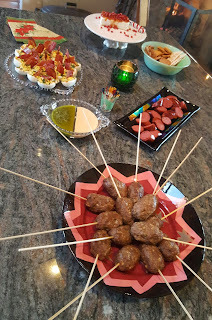 I love to make appetizers so will share a few I have made lately. 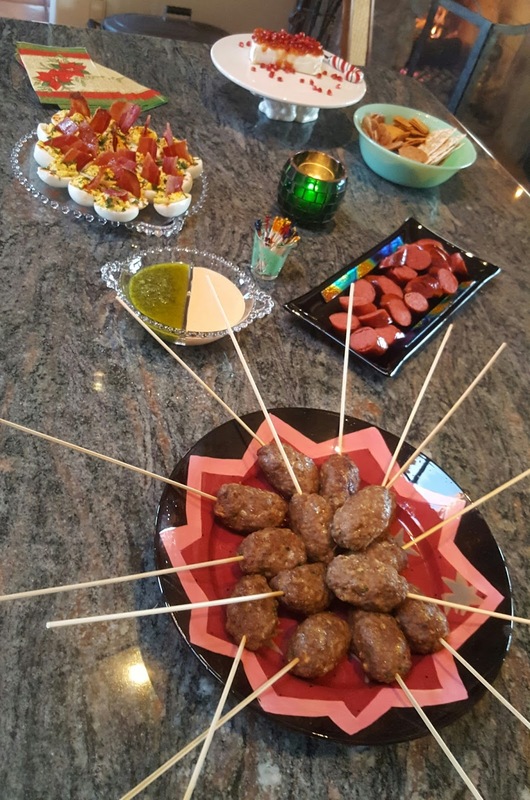 Front and center are Beef Koftas. There are hundreds of variations on this tasty treat. 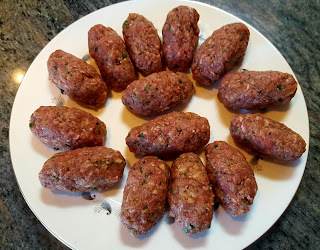 They can be made with beef, lamb, pork, chicken or a combination of several meats as you would an Italian meatball. Popular throughout the Middle East and Northern Africa, they are similar to a meatball, but spiced very differently. Kind of looks like a spaceship has landed! 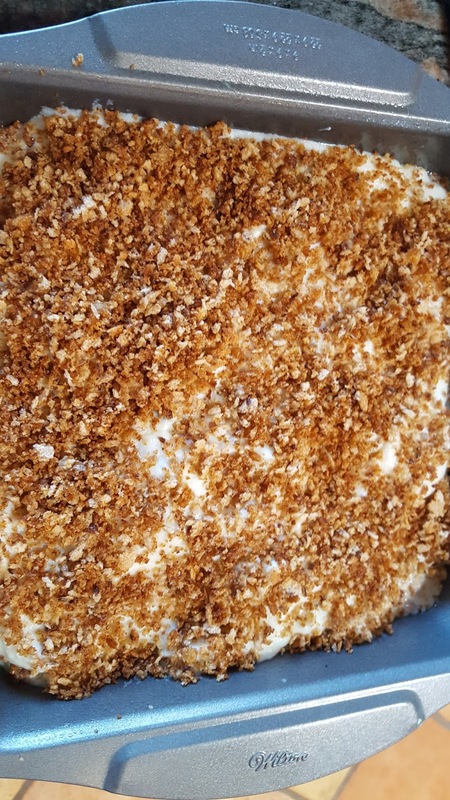 This recipe combines several different recipes I found online. I like the sweet of the raisins with the rich spices. I served them with two different sauces: Cooling Mint and Hot and Spicy Harissa yogurt. I also like the fact that all can be made in advance broiling the meat just before your guests arrive. In a food processor or mini food blender finely chop the onions and raisins. Add the cumin, garlic powder and allspice and blend until a thick paste is formed. Remove from the blender and add half the beef (if using a mini as I did; otherwise add the full pound). Pulse it a few times until the grind becomes more smooth. Add the paste into the meat and pulse again until incorporated. Add the fresh parsley, cilantro, salt and pepper. And finally, add the bread that has been soaked in milk. 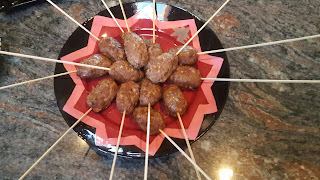 The bread helps to bind the koftas so they don't fall off the stick when you eat them. Remove the meat to a bowl and add the egg mixing thoroughly with your hands. Form into oblong shape (about 2 oz.--think 2 bites) and keep chilled in fridge until ready to broil. Bring to room temp before broiling. I made the mistake of skewering before broiling. I had soaked the skewers in water all day and figured they would not burn. Wrong. Because the meat is right under the broiler the wooden sticks 'catch' quickly. I did not start a fire, but it did come close. Very smoky! Next time I will broil and then skewer. As it was I had to remove all the burned skewers and re-skewer before serving. 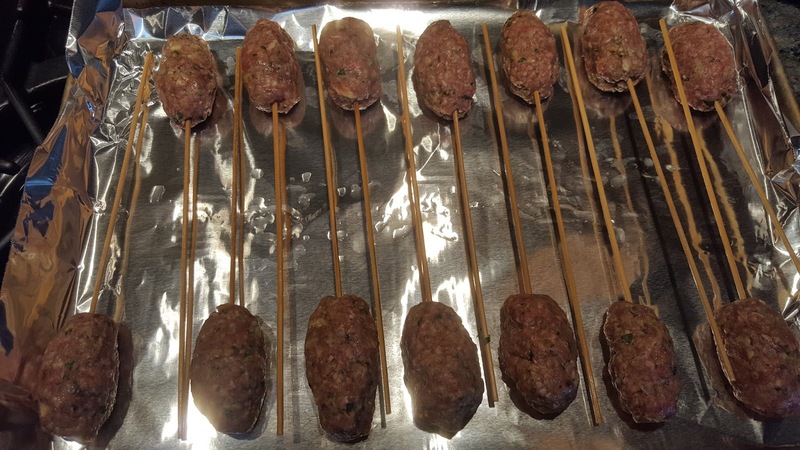 Broil for 5 minutes then turn koftas over and broil for another 5 minutes. Skewer and serve. In a food processor or mini-blender combine 2 cups packed fresh mint leaves, 2 Tbsp. chopped onion, 1 clove chopped garlic, 2 Tbsp. lemon juice, a little lemon zest, and 1/2 tsp. (or more to taste) salt. Blend until well combined. In a slow stream add 1/2 cup Extra Virgin Olive Oil. You may need more oil to achieve the desired consistency. Blend until smooth. 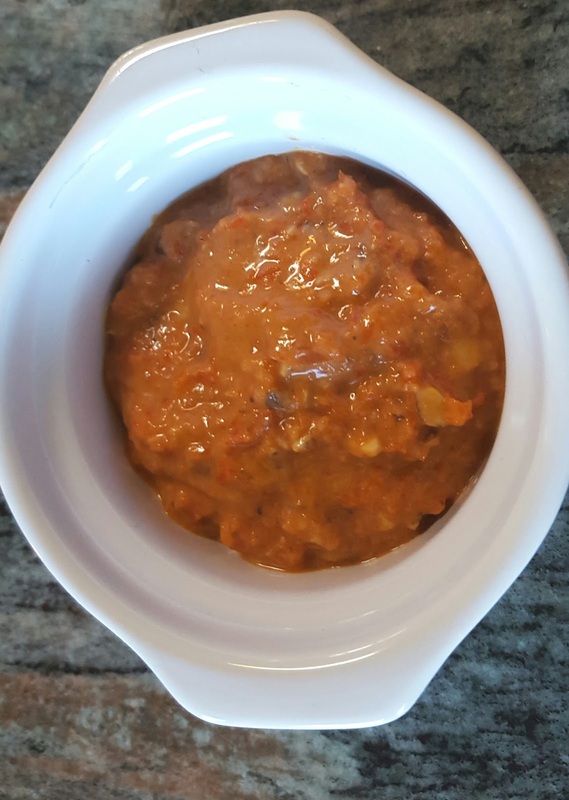 Harissa is a spicy pepper sauce from Northern Africa; Tunisia to be precise. In a bowl combine 1 cup plain Greek yogurt with 2 Tbsp. water to thin the yogurt to a dipping consistency. Add 2 Tbsp. (more if you want extra spicy) Harissa paste and 1 tsp. smoked paprika. Add 1/4 tsp. salt. Adjust seasoning. I've had this recipe so long I can't remember where it came from, but most likely Gourmet Magazine. Easy to put together and very flavorful. Delicious with an assortment of crackers, toasted baguette, or toasted pita bread. Puree roasted peppers, bread crumbs, walnuts, vinegar, cumin, cayenne and 1/4 tsp. salt in food processor until almost smooth. With motor running, add oil in a slow stream, blending until well incorporated. This is also a "do-ahead" recipe and can be made several days in advance. Bring to room temp before serving. The Candied Bacon make these traditional Deviled Eggs very special! Preheat oven to 350 degrees. Line a sheet pan with foil. 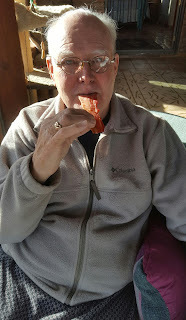 Lay strips of bacon on a rack on top of the foil-lined pan. Combine about a cup of brown sugar, 1/4 tsp. cayenne pepper, 1 tsp. cinnamon. 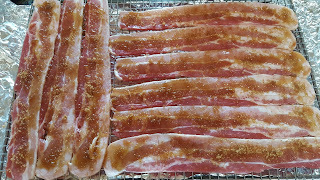 Sprinkle the brown sugar mixture on top of the bacon slices. If you happen to have pure maple syrup on hand, drizzle the bacon with a little syrup. Bake for 10 minutes. Flip bacon and repeat topping. Bake another 10 minutes or until bacon is crispy. 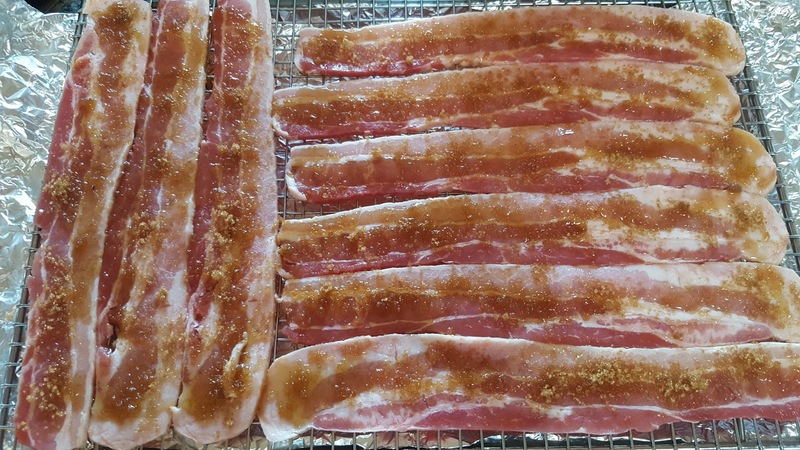 Because of the moisture of the sugar and syrup the bacon may not get crispy until it cools. If you like extra crispy bacon, pop under the broiler for a couple minutes, but use caution as the sugar burns very easily. 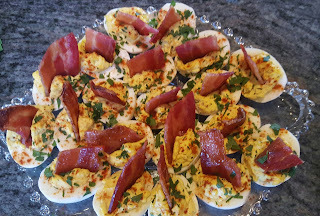 Prepare your favorite Deviled Eggs (I use mayo, grainy mustard, curry powder, salt, white pepper) and top with large slices of the Candied Bacon. I garnished my eggs with freshly chopped parsley and smoked paprika. to make sure it was alright for serving! 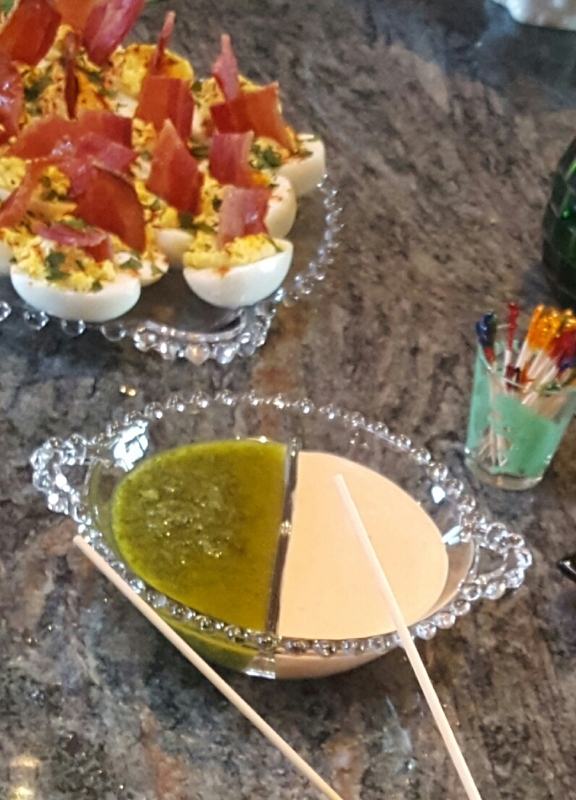 This simple appetizer is one of my favorites and the easiest of all. Place a block of cream cheese on a serving tray. Cover generously with Raspberry Chipolte jelly. Our pomegranate tree bore fruit for the first time this year so I topped with pomegranate seeds which add a nice element of texture. Serve with assorted crackers. 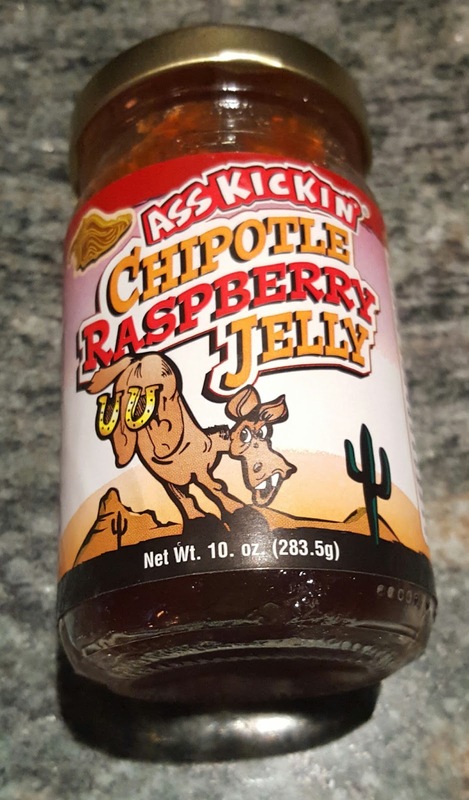 This jelly is not as "AssKickin" as advertised, but it was the perfect complement to the smooth and mild cream cheese. 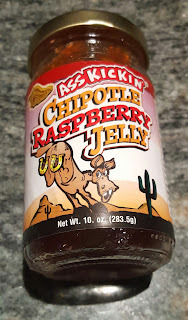 I bought it at the Santa Cruz Chili and Spice, Co. in Tumacacori, (www.santacruzchili.com) but similar jellies are readily available at Trader Joes and many other locations. 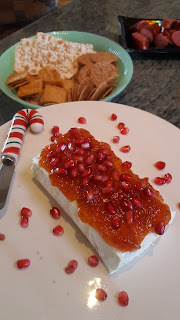 I LOVE TURNING APPETIZERS INTO DINNER, ESPECIALLY DURING THE HOLIDAYS WHEN WE (THAT'S ME!) TEND TO OVERINDULGE! ENJOY THIS BEAUTIFUL AND FESTIVE SEASON! ...And Acorn, and other squash season, too. 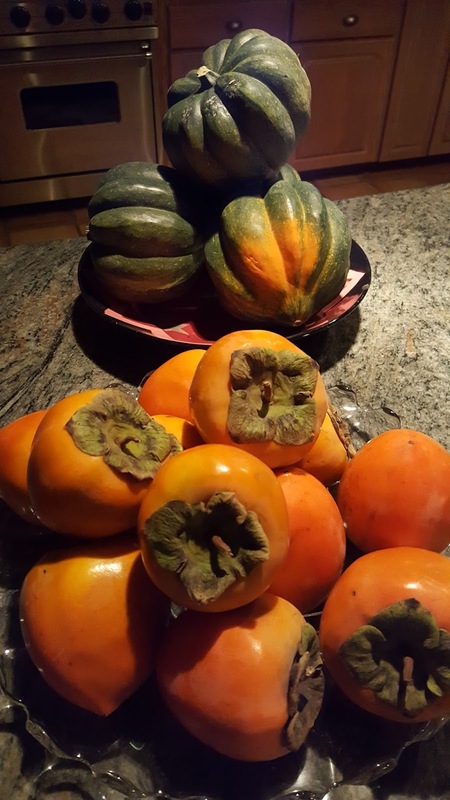 Persimmon run a little longer--October to February, where squash is in-season October to December, although stores carry squashes almost year-round. So if you are buying in July know that it has been picked awhile. I was fortunate to receive this freshly picked bounty from our good neighbors, Brian and Lori Itule, who are in the food business. Thank you friends! The first thing I decided to do was roast and stuff these beautiful squash. 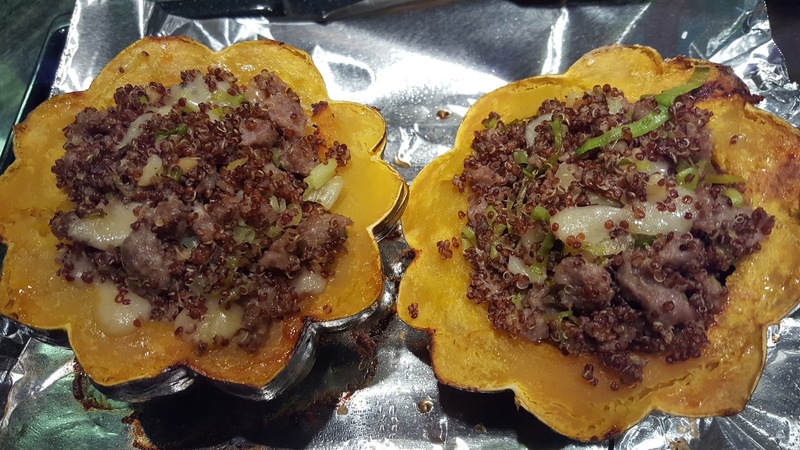 Cut the squash in half and scrape out the seeds and stringy pieces. 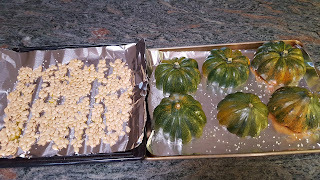 If you want to save the seeds, rinse in a colander and pull off any remaining squash pieces. 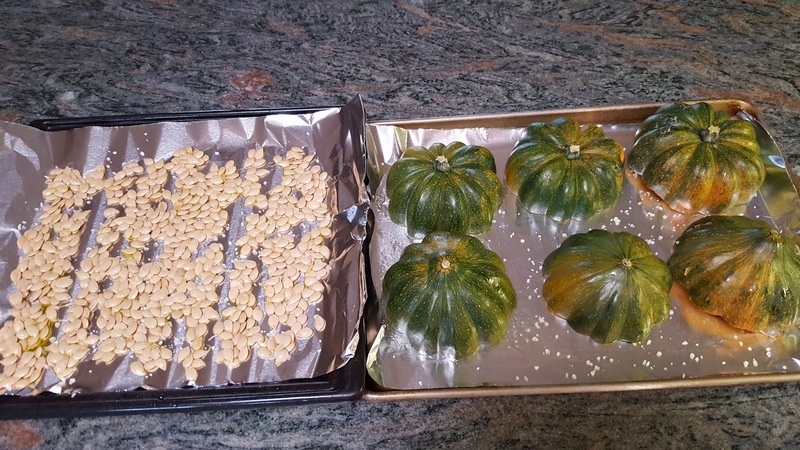 Spread the seeds on a foil lined baking sheet. Drizzle 2 Tbsp. olive oil and sea salt over the seeds. Roast for about 10-15 minutes at 375 until seeds start to pop. Remove. Cool. Enjoy! If you decided to roast the seeds, reduce oven temp to 350 degrees. Rub the insides of the squash with olive oil and salt liberally. Place cut side down on a foil lined baking sheet. Bake for about 45-50 minutes or until squash is just tender. Timing will depend on the size of your squash. Mix all ingredients together and fill squash. Either set aside or re-bake at 350 degrees for about 20 minutes until cheese is melted. These squash are delicious filled with about any combination of grain, veg, nut, and dried fruit you can come up with. Have fun experimenting! I am going to try them stuffed with Persimmon! 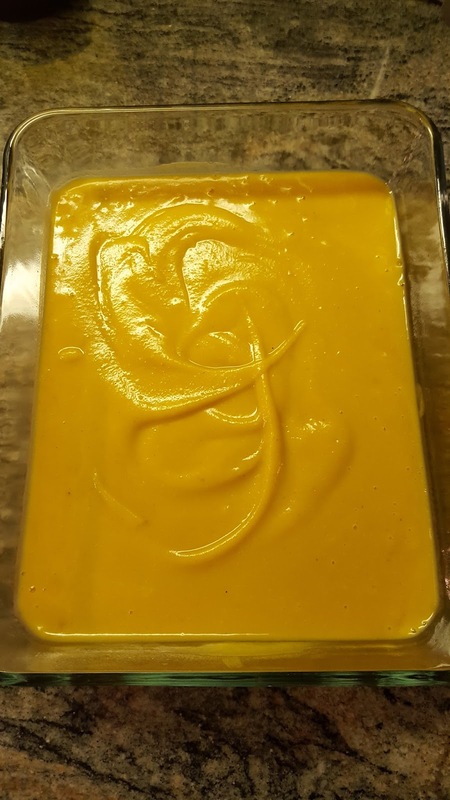 Since the oven was hot and I had lots of squash I roasted the rest of the squash and made Acorn Squash Soup. This time I kept the soup very simple. Bring 1 Qt. of chicken stock to boil. Add a diced carrot, diced celery stalk, and 1/2 diced onion. Simmer until veg is tender; about 20 minutes. Scoop out the roasted squash from the shells (cool first) and add to the stock. Cook another 10 minutes. Season with salt/pepper. Let cool and blend either in the blender or using an emulsion blender. It is so rich and creamy that no cream is necessary! It also freezes well. And now on to the Persimmon. I found this recipe for Persimmon Bread on http://allrecipes.com/recipe/6964/persimmon-bread-ii/. The only change I made to the recipe was to cut the sugar from 3 cups to 2. Now that my fruit is a little more ripe I will add 1 1/2 cups sugar. My batter easily filled 5 little bread tins, not 3. 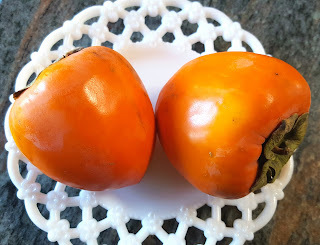 There are several varieties of Persimmon that have different characteristics. These Persimmon are called Hachiya or Japanese Persimmon. When the fruit is not completely ripe it has a very astringent, pucker your mouth, kind of feel. Delicious taste, but mouth-feel not so nice, but once cooked they lose that mouth-feel and their delicious delicate flavor comes through. And once ripe, they lose most of that puckery feeling when eating raw. I love the way these fruit look inside! Preheat oven to 350 degrees. 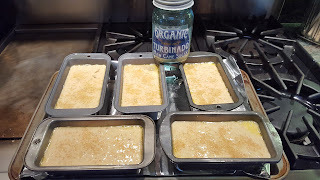 Grease 5 mini loaf pans (6x3"). 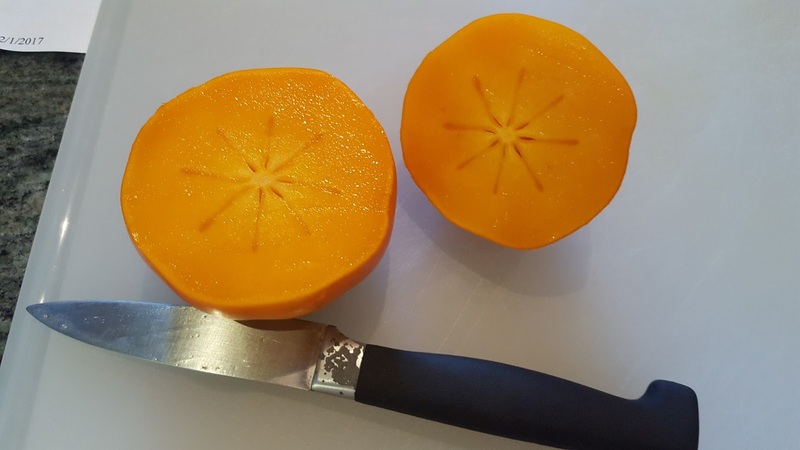 In a small bowl, stir together the persimmon pulp and baking soda. Mix so the soda dissolves. Let stand 5 minutes to thicken the pulp. In a medium bowl, combine sugar, oil, eggs, cinnamon, nutmeg, and salt. Blend until smooth. 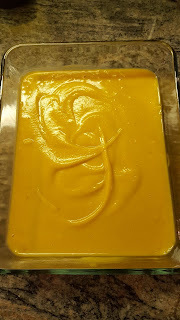 Mix in persimmon pulp and water alternately with flour. Fold in nuts. Divide batter into prepared pans, filling each pan 2/3 full. Top the uncooked breads if you like with a sprinkle of Turbinado Sugar. Bake for 1 hour or until a toothpick comes out clean. Cool in pan for 10 minutes before removing to a wire rack to cool completely. in preparation for the festive Christmas Holiday! MUCH LOVE FROM MY KITCHEN TO YOURS! I am feeling HO! HO! HO! festive. So many parties...so little time! Don't you want to just dive into that sauce?!? I made this several days ago. It keeps well in the fridge for up to 2 weeks. I make a variation of it every year. Go to: http://cookwithcindy.blogspot.com/search?q=cranberry+sauce for the original recipe. 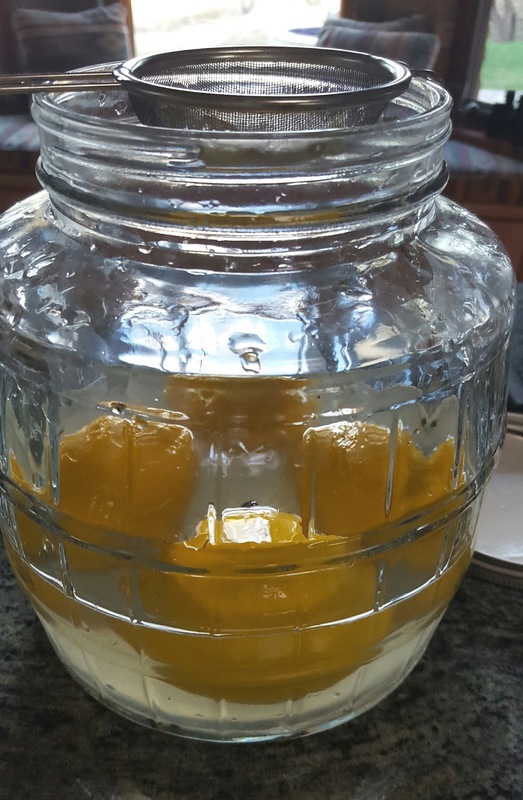 This year I used half the sugar and all freshly squeezed orange juice for the liquid. 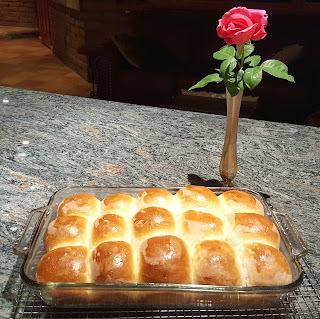 (Go to: http://cookwithcindy.blogspot.com/search?q=do+ahead+rolls and scroll nearly to the bottom to get this recipe. I make them every year because they freeze well and that is one less thing to prepare as the big day approaches. This is a take on the old fashioned (and pretty horrible) Canned green bean casserole with canned mushrooms and canned shoestring onions on top. This one looks a little better and was fairly easy to put together. The cauliflower cream is really delicious! You still have time to do this before Thursday. Recipe follows. I believe this will freeze well, but have never tried so we will see! The addition of sautéed leeks looked wonderful and topping with crispy shallots and chives put this plain mashed potato recipe over the top. The recipe follows. 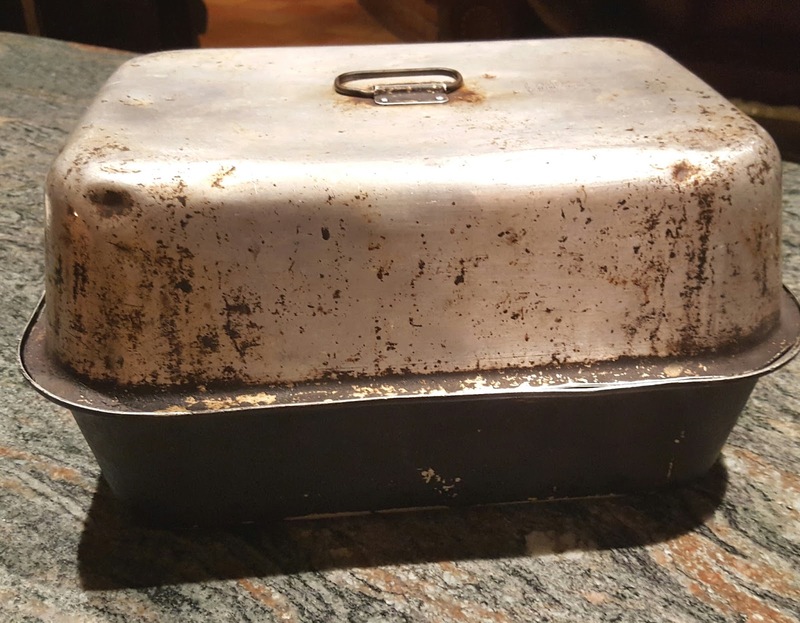 This was my Nanna's roasting pan. It has seen many a turkey! The Pear/Sage Stuffing has complex flavors and will only intensify when cooked in the bird on Thanksgiving morning. I know most caution about roasting your bird stuffed, but I have been eating turkey that way since a child and cooking it that way all my life, as has my Mom long before I was born so I will keep that tradition alive! Stuffing recipe follows. And finally, my "DO-AHEAD GRAVY" will also be on our Thanksgiving table. 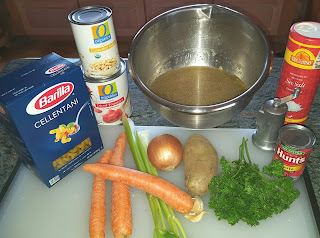 Here is the link: http://cookwithcindy.blogspot.com/search?q=do+ahead+gravy You will love this gravy recipe. So silky with rich, deep flavors. This is a winner. I do not like making gravy day of the holiday. Everyone is anxious to sit down and you are still toiling in the kitchen trying to get lumps out. This takes all the tension out of making gravy. 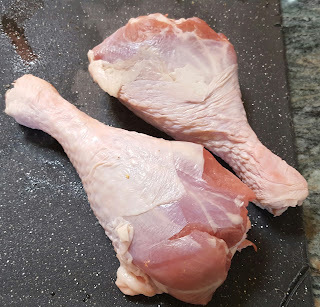 These are the turkey legs I used to make this year's gravy. Looks like something you'd see on the Flintstones sideboard. 3 cups chopped cauliflower, about 9 oz. 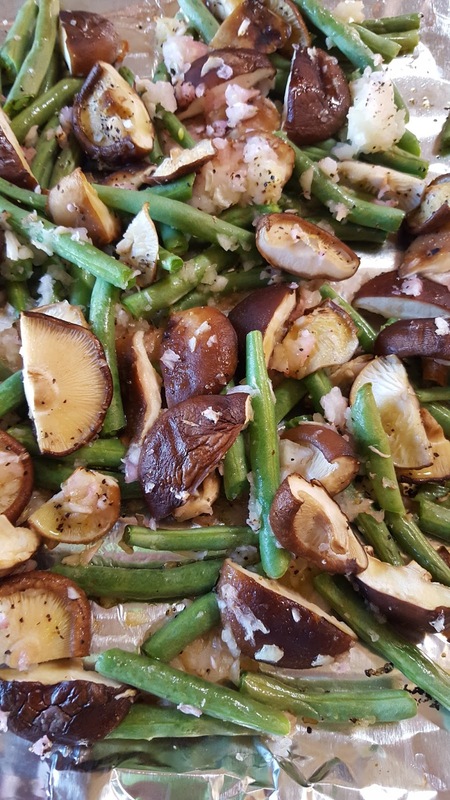 Here are the roasted onion, mushrooms, and green beans. Preheat oven to 425 degrees. Combine onion, 2 Tbsp. oil, 1/2 tsp. salt, 1/4 tsp. pepper, green beans, and mushrooms on a foil-lined baking sheet. Bake at 425 degrees for about 15-20 minutes. Bring cauliflower and next 5 ingredients (through garlic) to a simmer in a saucepan over medium heat; cook 25 minutes or until tender. Remove pan from heat. Let cool slightly. Carefully place cauliflower mixture in blender; blend until very smooth. Return puree to pan; stir in remaining 1/2 tsp. salt, remaining 1/2 tsp. pepper, and sherry and nutmeg. 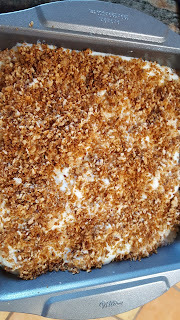 Place green been mixture in a 9x9 inch baking dish coated with cooking spray; top with bread crumbs that have been mixed with 2+Tbsp. oil. Sprinkle over dish. At this point, I froze, and will thaw completely before baking for 10 minutes at 425 degrees. Bring potatoes to a boil in a large Dutch oven or saucepan filled with water. Reduce heat to medium; simmer 20 minutes or until tender. Drain; return potatoes to pan. Add chicken stock, half and half, cream cheese, salt, pepper. Mash to desired consistency. Melt butter in a skillet over medium-high heat. Add leeks; saute 5 minutes. Stir leek mixture into potato mixture. Do not wipe out skillet. At this point I froze the potatoes and will finish the crispy shallots and chives on Thanksgiving morning, but if you are making on the spot...return skillet to medium-high. Add oil and shallots; cook 3 minutes or until shallots are browned and crisp. Spoon mashed potatoes into a serving dish and top with crispy shallots and chives. This is a recipe from Cooking Light, which I have changed up a bit, so not quite so light. Preheat oven to 400 degrees. Toss bread cubes in various herbs and spices: finely diced fresh rosemary, fresh sage, Bell's seasoning, garlic powder, onion powder, Salt. 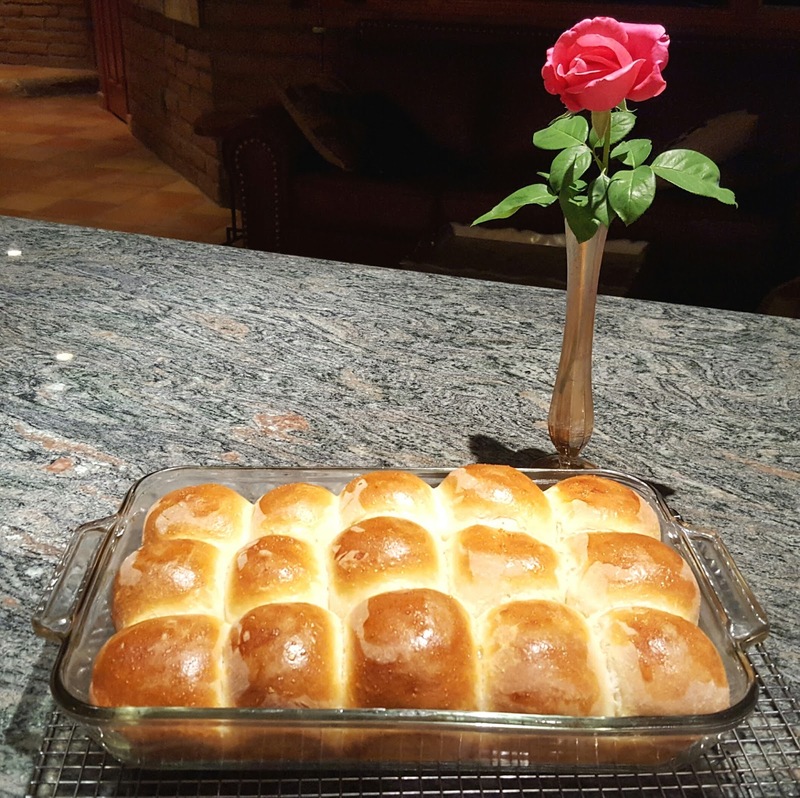 Arrange bread cubes in single layer on a rimmed baking sheet. Bake at 400 for 20 minutes or until golden, stirring after 10 minutes. Place bread cubes in a large bowl. Reduce oven temp to 350 degrees. Place raisins in 1/4 cup hot water to plump. Let stand 10 minutes. Drain. Cook bacon slices in a skillet over medium heat until crispy; about 10 minutes. 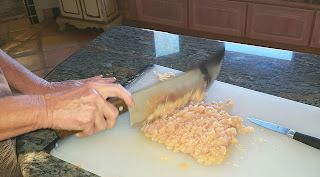 Remove to paper towel-lined plate; crumble. Add 1 Tbsp. butter to bacon drippings, onion, celery and saute for 8 minutes. Add 1 Tbsp. sage and garlic; cook 1 minute more. Remove pan from heat. Combine stock, butter, pepper, and eggs in a large bowl. Add stock mixture, drained raisins, bacon, pear, and veg mixture to bread. Toss to combine. At this point I froze and will thaw completely before stuffing the bird. You may also coat a 2 quart baking dish with cooking spray and bake at 350 degrees for 25 minutes, if you do not want to stuff it in the bird. If you cook it separately it should be called Un-Stuffing. The outpouring of love from friends and family has been overwhelming. The love and devotion from my husband has served to strengthen our wonderful relationship. And I truly feel this has brought me closer to God. 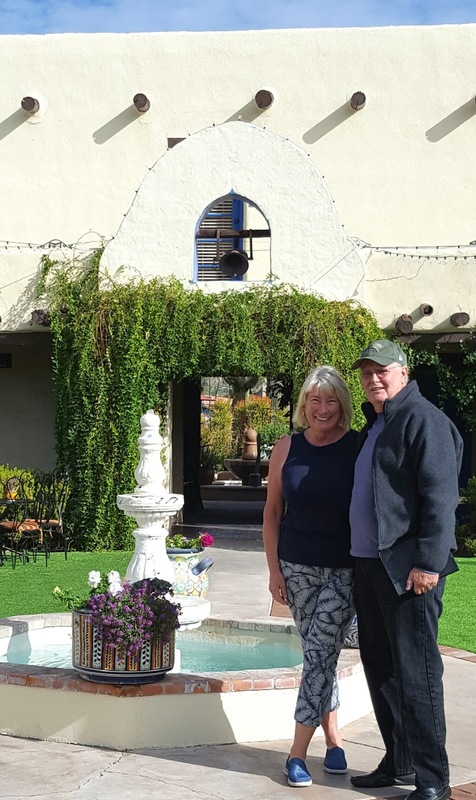 at Hacienda del Sol in Tucson. Fabulous, elegant, and understated Ranch. 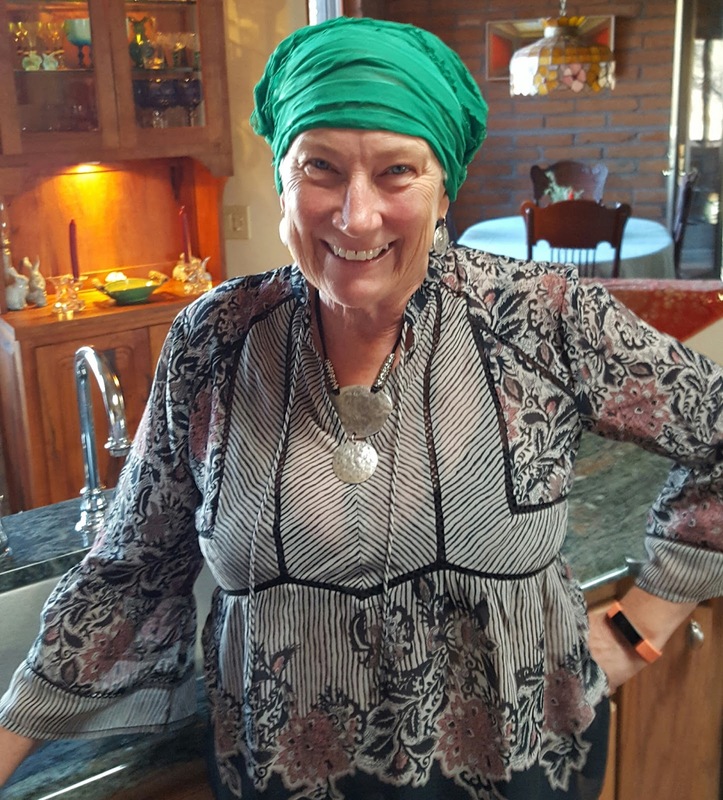 It's finally beginning to feel like fall here in beautiful southern Arizona and time to start making soup! fresh parsley and a little parmesan cheese. 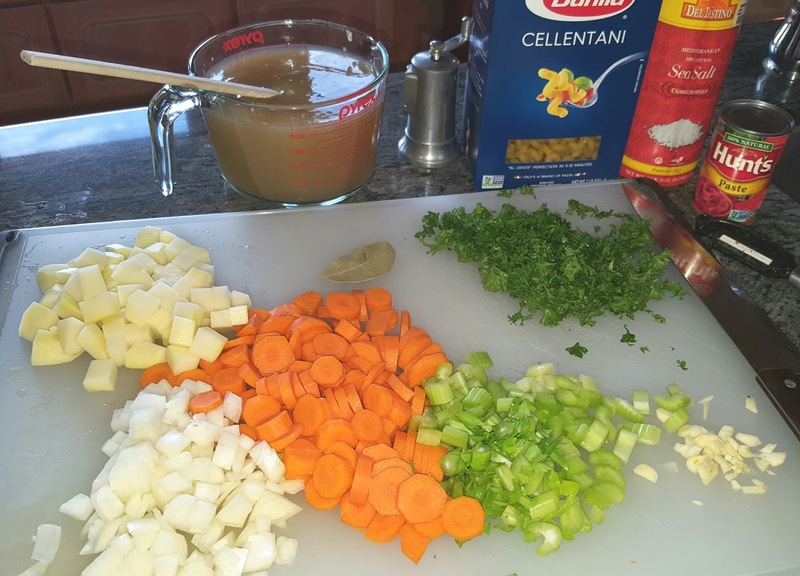 An Italian classic, you do not really need a recipe for Minestrone Soup, but it generally contains seasonal vegetables--carrot, onion, celery, potato; beans-cannellini or some other type of bean; pasta or rice. 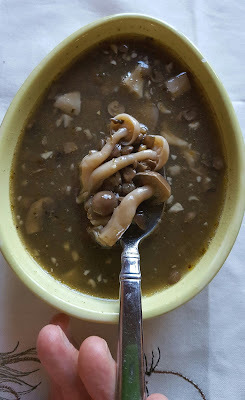 This soup dates back to 30 AD where a recipe appears in Marcus Apicius's ancient cookbook De Re Coquinaria (which translates to On The Subject of Cooking) described as polus, a Roman soup made up of farro, chickpeas, and fava beans, with onions, garlic, lard, and greens thrown in...that sounds a little heavy to me, and in fact, over time the recipe has changed quite a bit to include more veg and depending on the season and availability meat or chicken. 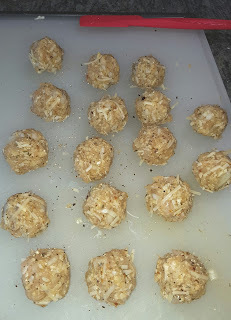 I like to add meatballs to Minestrone, either beef or chicken, and this morning decided on spicy chicken meatballs. Again, completely up to you. Here is the recipe I came up with. You don't have to chop the veg too finely. I like them kind of chunky because this is a rustic soup. In a large stock or soup pot bring chicken stock to a boil. Add celery and onions. Reduce heat to a gentle boil (medium-low). Cook for 10 minutes. Add carrots and potatoes. Continue cooking another 10 minutes. Add 1 cup diced tomatoes, tomato paste, thyme, sage, bay leaf and cook another 10 minutes. Add beans and cook another 10 minutes. Add pasta, garlic, fresh parsley and oregano. If you are eating the soup right away cook for 10 minutes. If not, only cook the pasta for 5 minutes or it will get mushy. Take off heat, let cool, and either package for fridge for the next couple days or freeze to have down the road. And, next is my recipe for SPICY CHICKEN MEATBALLS. Make these meatballs as mellow or spicy as you like. Just reduce red pepper flake and black pepper to get a milder ball. To start remove any chewy white tendons. This is kind of a pain, but you will be happier with the end result...a much more tender ball. 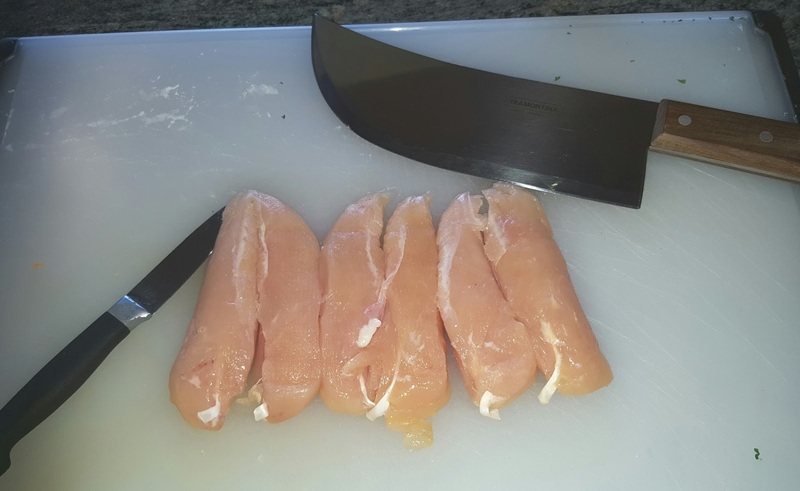 Next, chop the chicken breasts. I used my gorgeous meat clever that my husband, Jerry bought me earlier this year, but any very sharp knife will work. Mince the chicken. Add garlic, onion, salt, peppers, 1 egg, panko crumbs and parmesan. Gently work all ingredients using your hands until well mixed. Form balls (the chicken will be quite loose and moist) and let the balls sit for about 15-20 minutes to help them firm up and dry out a bit. need all for the Minestrone, but they freeze well. Heat olive oil in a heavy skillet until smoking. By starting on a high heat you get a nice crust on the ball. 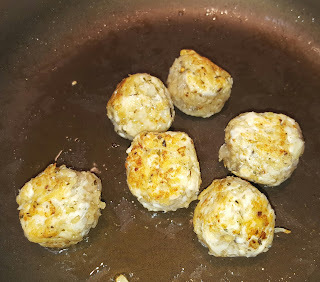 Gently drop a few balls in, lower heat, and brown well on all sides rolling around in the pan. Cook only 6 balls at a time to give yourself room to turn the balls. Reduce heat further and cook for another 10 minutes. Remove and repeat with uncooked balls. Many soups, including this one, offer a license for total creativity. Please let me know what you come up with! 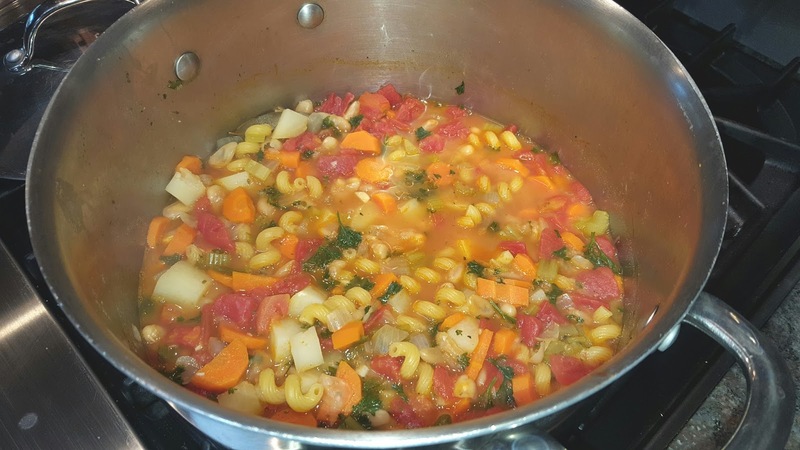 Here's another soup I put together that turned out really well. 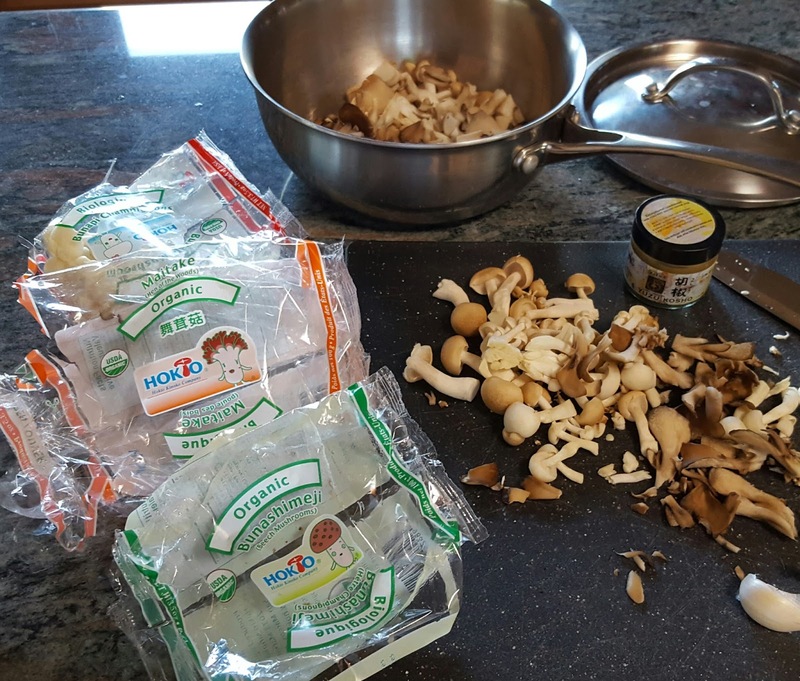 I recently learned that wild mushrooms, especially these Asian mushrooms are really good for you. Healthy + Tasty = GOOD. This is another recipe where you can take many liberties, but here are the basics. Bring 1 quart of rich chicken broth to boil in a large soup pan. Add minced onion and garlic and slowly simmer for about 20 minutes. I wanted this soup to be all about the mushrooms so did not want to heavily season with other herbs. Lower heat to a very gentle boil and add Yuzo and all the mushrooms. Simmer for another 20 minutes. Add the pre-cooked lentils and basil and simmer for another 15 minutes. 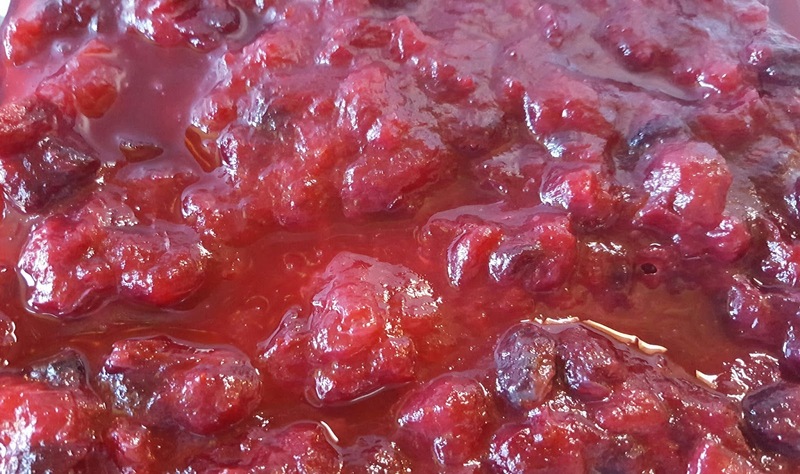 Delicious on the spot or holds well in the fridge for 10 days. *To make rich chicken stock: Make a regular chicken stock and then re-cook with another batch of bones and herbs. Yum! Yum! Yum! Very rich and so much better for you because of all that collagan, but most importantly the taste. 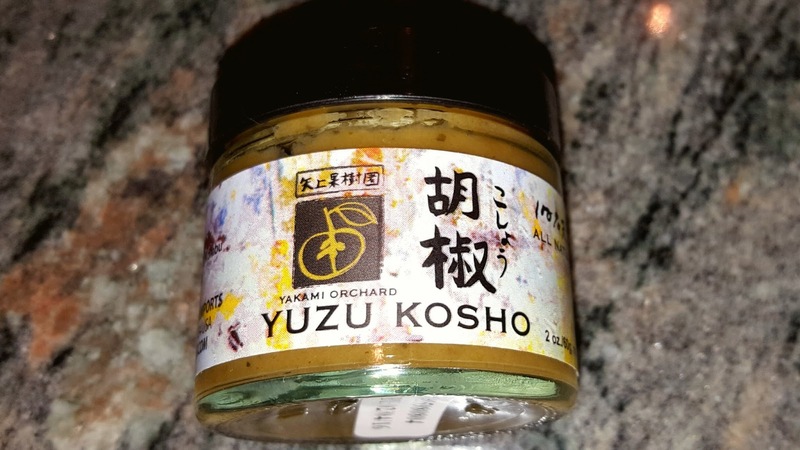 ** A quick word about Yuzo Kosho. 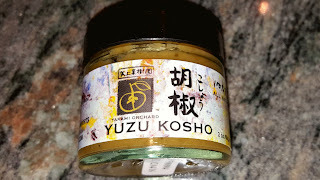 I am still learning about yuzu, but this spice is amazing! This paste is made from fresh chiles, fermented with salt along with the zest and juice of yuzu, a tart, fragrant East Asian citrus. It's lemony, limey, luscious and delicious! I will try it in many different recipes. IS THAT ALL FOR TODAY? ABOUT FOOD, FOOD, GLORIOUS FOOD! HOPE YOU ENJOYED THESE COUPLE OF SOUP RECIPES AND PLEASE REMEMBER...SOUP IS NOT LIKE 'BAKING'...YOU DON'T HAVE TO MEASURE AND YOU CAN GET VERY CREATIVE. BEING THE KICK OFF FOR US! GOOD TIMES AHEAD IN THE KITCHEN! STAY TUNED FOR MANY FUN FOOD ADVENTURES. 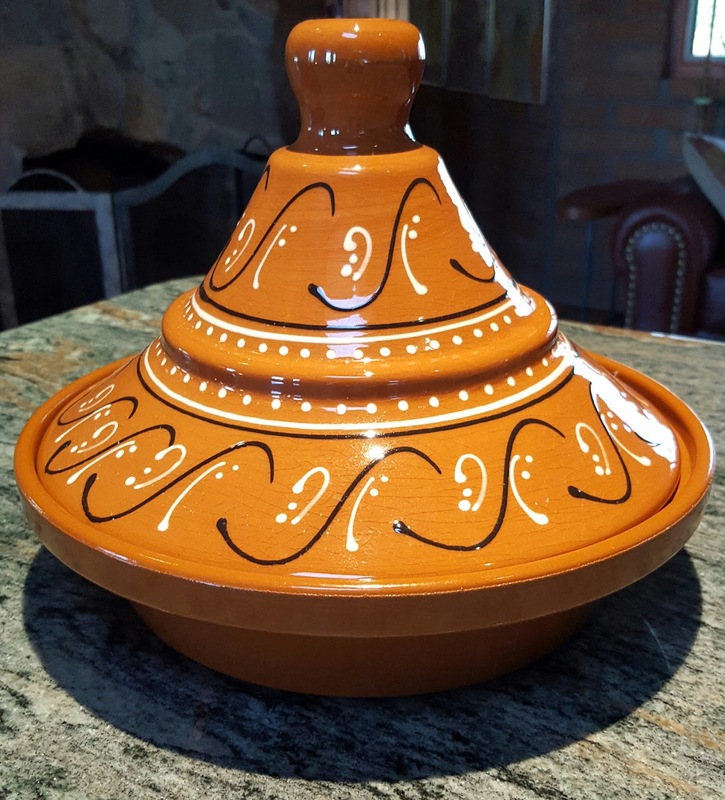 I received this lovely North African cooking vessel from my good friends, Dennis and Diana Makes 3 years ago, and I have been hesitant to use it. Why, I am not sure, as I generally am not shy about anything in the kitchen. 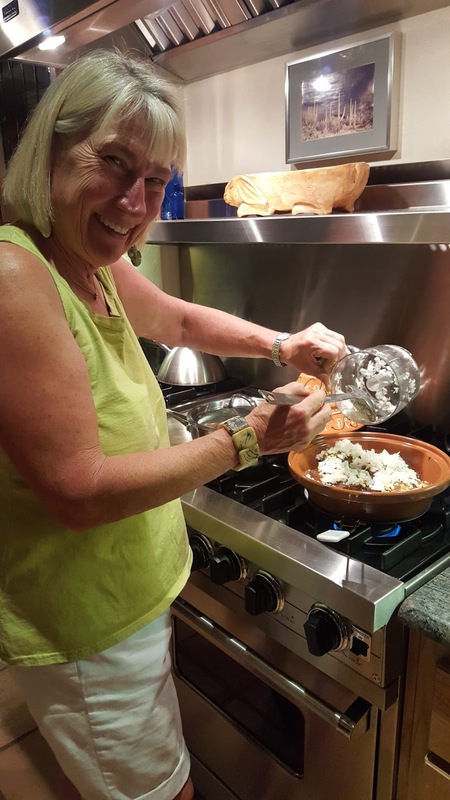 I have never cooked in a Tagine and am still perplexed I did not do the research right away to see how easy (and fun!) it is to use. I am so glad I finally did. What a great night we had cooking together. If cooking in your Tagine for the first time, you have to "cure" or "season" it. First, soak both top and bottom for several hours or overnight in water. I have a round prep sink that was the perfect size for soaking both pieces. Dry well. Next, place in a cold oven set for 300 degrees and "cook" for 2 hours. 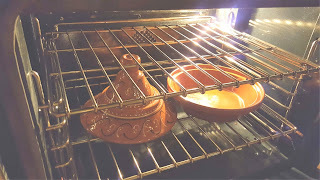 Turn the oven off and let the Tagine cool in the oven. When cool, gently hand wash in soapy water. Dry and rub lightly with olive oil for storage. Now you are ready to cook! Now that I have used it I can see the possibilities for great combinations of spices, herbs and flavors; meats, sauces, fish, are endless! 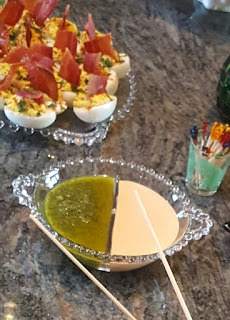 Here is the first recipe we tried, which I found online at Simply Recipes. I followed fairly closely, with only a couple variations, since it was my first time. 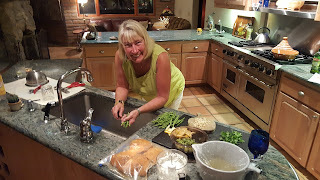 Preparing the green beans, which accompanied our meal. Diana prefers to set all the ingredients out before beginning her cooking so that is what we did. I go back and forth, but was happy to do it that way since she was the guest in my kitchen. It does help you to NOT forget an ingredient. Make the spice rub by combining all spices--paprika, cumin, ginger, turmeric, cinnamon, black pepper--in a large bowl. Pat the chicken pieces dry and put in the bowl, coat well with the spice mixture. Let the chicken stand for one hour in the spices. I like to put the pieces in a zip lock bag so every so often you can turn them easily to ensure that all pieces get the benefit of the spice rub. 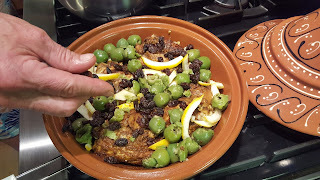 Add the olive oil to the Tagine. 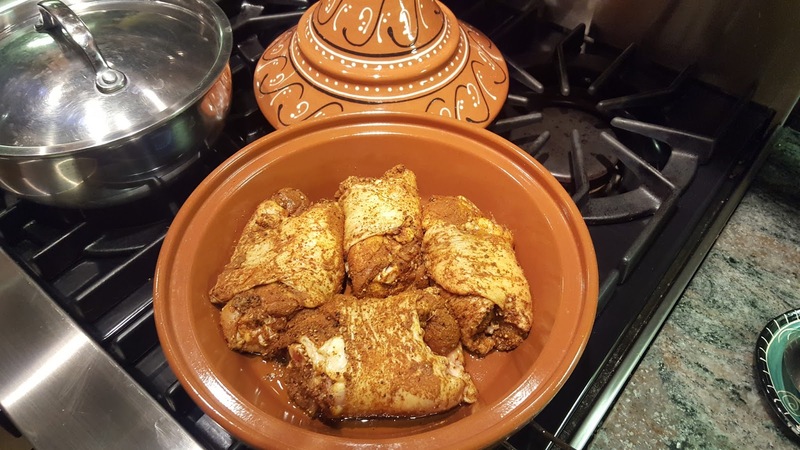 Brown the chicken on medium heat in your Tagine (you can also use an ordinary skillet, but this is much more exotic!). If you are using a clay Tagine on top of the stove you must place a heat diffuser underneath to prevent it from cracking. 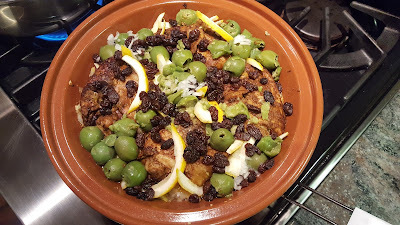 Sprinkle the chicken very lightly with salt (both olives and preserved lemon are salty). Cook for 5 minutes or until lightly browned. Ready to cook for the last 30 minutes. 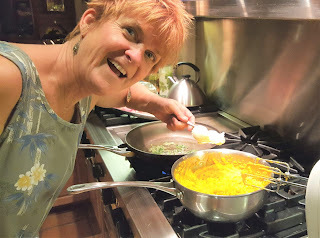 Here I am adding the onions. Add garlic and onions, (and freshly grated ginger root if you are using it) and water, then cover and simmer: Turn chicken pieces over. Add the lemon slices, olives, raisins, and 1/2 cup water. Bring to a simmer on medium heat, then lower heat to low, cover, and cook for an additional 30 minutes until chicken is cooked through and tender. Stir in parsley and cilantro. Adjust seasoning to taste. and farro cooked in rich chicken broth topped with fresh cilantro. Place 3 to 4 lemons in a container large enough to cover with water. Add 3 Tbsp. Kosher salt, a few peppercorns and the juice of 1/2 lemon. I am tasting this delicious dish all over again. Wish it was on the menu tonight! I will let you know what I come up with next using my beautiful Tagine. Besseha and Ma-saa Al Kh-ir! PROSCIUTTO WRAPPED CHICKEN WITH SAGE! This recipe came to me via my friend, Debby Vis, which she got from her "America's Test Kitchen-6 Ingredient Recipes" cookbook. 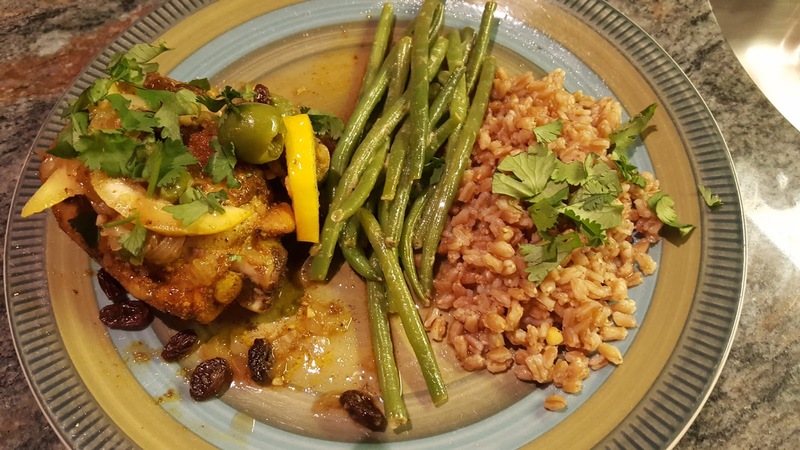 I have been a fan of Christopher Kimball's "Cooks Illustrated" for many years so was delighted to try this easy chicken dish. 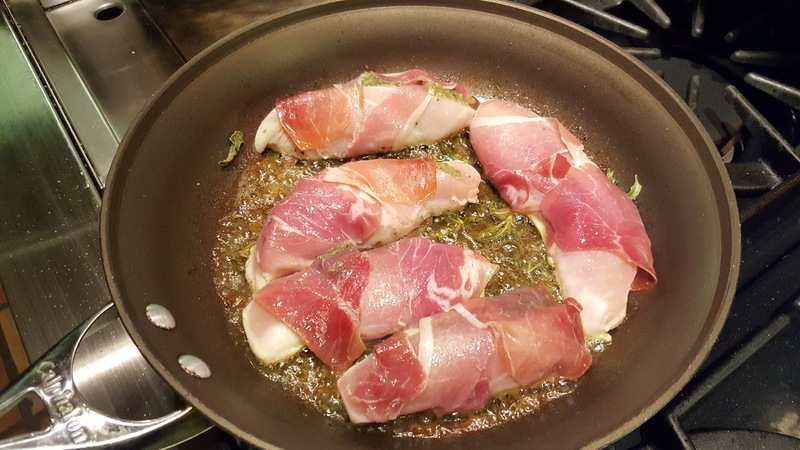 It's a simplified version of the Italian classic Chicken Saltimbocca, but was a snap to put together. It took me under 30 minutes to prepare and cook this meal. I did make it an 8 ingredient dish, but it was still very easy to put together! I added basil pesto inside the chicken breasts and topped with pomegranate seeds from my own pomegranate tree. Both ingredients are optional. 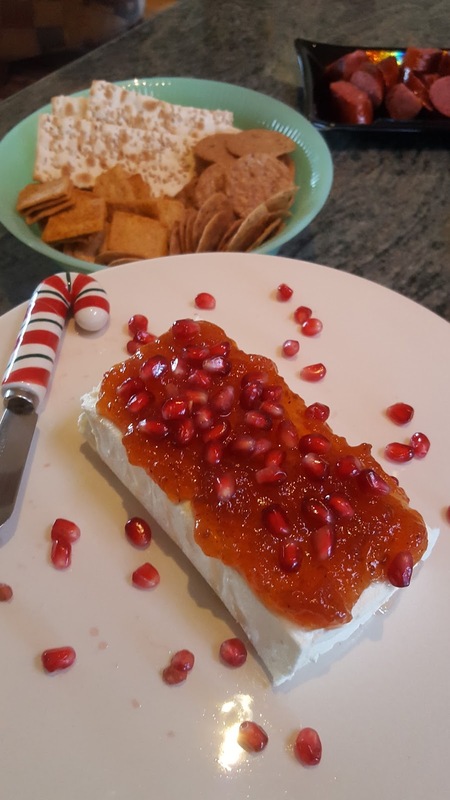 Pomegranate seeds, also optional, but they do add a nice pop to the dish! Preheat oven to 400 degrees. Trim chicken, rinse and pat dry. Season with salt/pepper. If you are using the basil pesto, cut a slit along the fat end of the chicken breast and put 2+ tsp. basil pesto into the slice. Slightly overlap 2 slices of prosciutto on cutting board and lay 1 chicken breast in center; fold prosciutto over chicken. Repeat with remaining prosciutto and chicken. Heat oil in a 12" nonstick skillet over medium high heat until just smoking. Place chicken in skillet and cook until lightly browned on both sides, 6-8 minutes. I deviated from the recipe here, too, by adding the whole sage leaves (about 1/3 cup of leaves) into the pan as I was browning the chicken. The sage then becomes nicely fried and sticks to the chicken. Transfer chicken to rimmed baking sheet and bake until it registers 160 degrees, 10-12 minutes. Transfer chicken to a platter and cover to keep warm. If you are following the original recipe, mince 2 tsp. sage and squeeze juice from a lemon into a bowl. 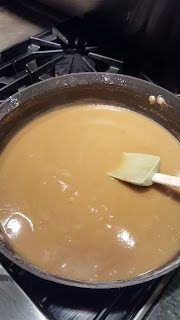 Melt butter in now-empty skillet over medium-high heat, swirling occasionally, until butter is browned and has a nutty aroma, about 1 1/2 minutes. Off heat, stir in sage, pinch of salt and 1/8 tsp. pepper. Drizzle sauce over chicken and serve. If you are making this dish as I did, still make this brown butter as it is a wonderful sauce, which pulls the dish together. 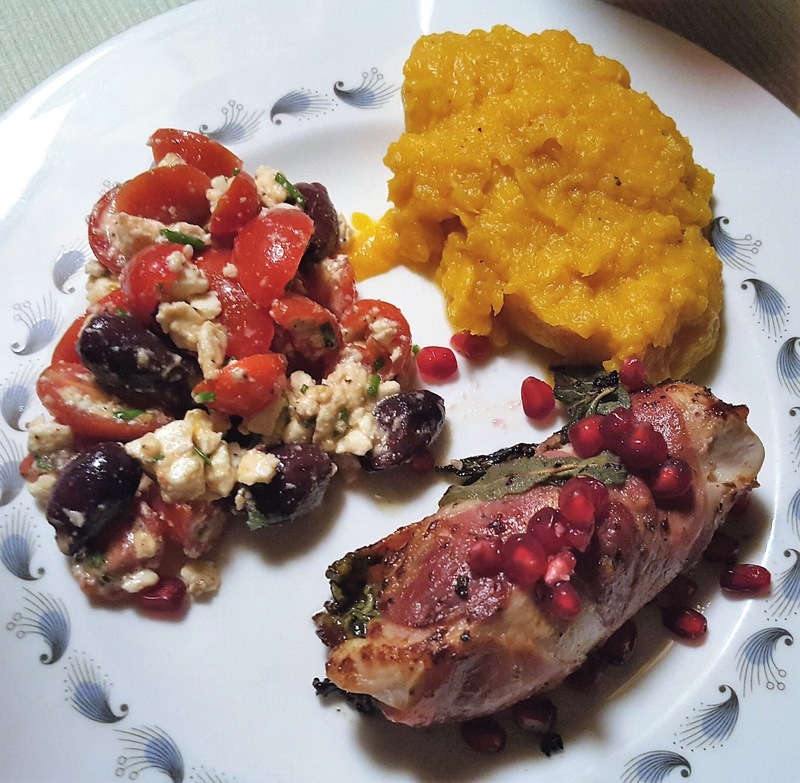 I served the Prosciutto Wrapped Chicken with Butternut Squash, which had a unique addition, thanks to Debby's husband, Steve's creative cookery. What is that mystery ingredient? Debby served me this wonderful chicken dish the other day along with the Butternut Squash and a Tomato Caprese salad. The squash had a unique flavor that I could not identify. After questioning, she told me her husband Steve added a big tablespoon of vanilla ice cream to the squash after mashing. The rich, sweetness of the ice cream was the perfect addition. Thank you, Steve! I would have never thought of that! Peel the squash. Cube into 1 inch pieces. Cook in salted water until very tender. Drain. Add 4 Tbsp. butter, salt, pepper, cinnamon, and the surprisingly delicious vanilla ice cream (one fat tablespoon)! To complete this meal, I made a salad of sliced cherry tomato, black olive, feta cheese, and chives, drizzled with a white balsamic vinegar. 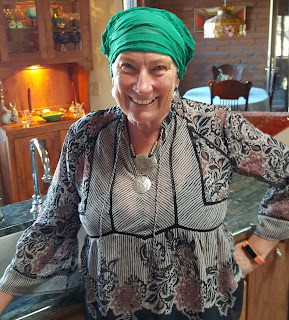 I made this meal for my friend Paula Schaper. 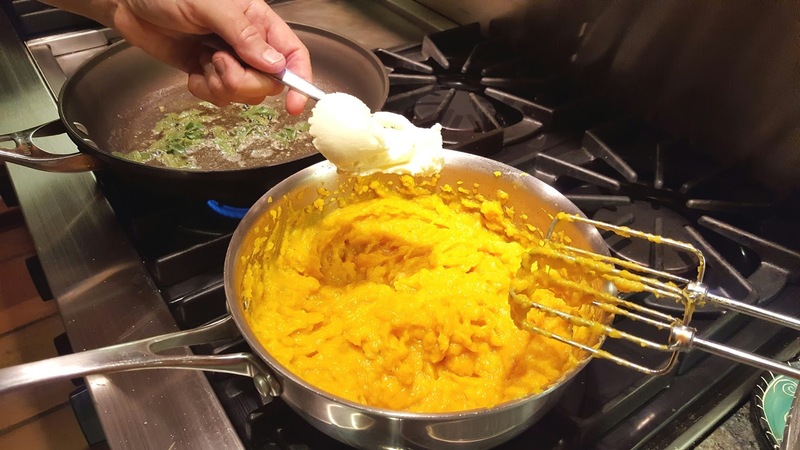 ice cream into the Butternut Squash! 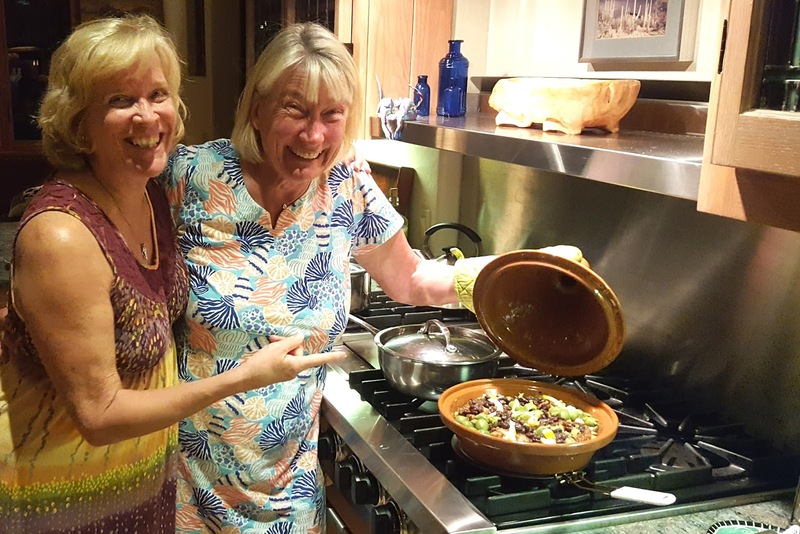 Cooking with friends is so much fun! I have a very exciting blog in mind for next time. Moroccan Chicken with Lemon and Green Olives!